"Anytime you're ready", said the waitress. "No rush." With that, she plopped the black check sleeve on my breakfast table this morning. I nearly chocked on my bagel, onto which I had only just smeared a generous layer of cream cheese. I was sitting in the ordinary restaurant of an ordinary hotel in an ordinary Canadian city, and my expense account had just bought into the $16 continental breakfast buffet. Less than a minute before, I'd returned to my table from the buffet, carefully balancing a plate of baked goods and cold cuts, a bowl of cereal and a banana. A teapot was steaming in front of me. My meal was not about to be over. Sadly, but commonly, this did not stop the waiter from already presenting me with the bill - an act that my European self understands as the ritual end of any restaurant visit. To my chagrin, the matter is handled rather differently in North America. 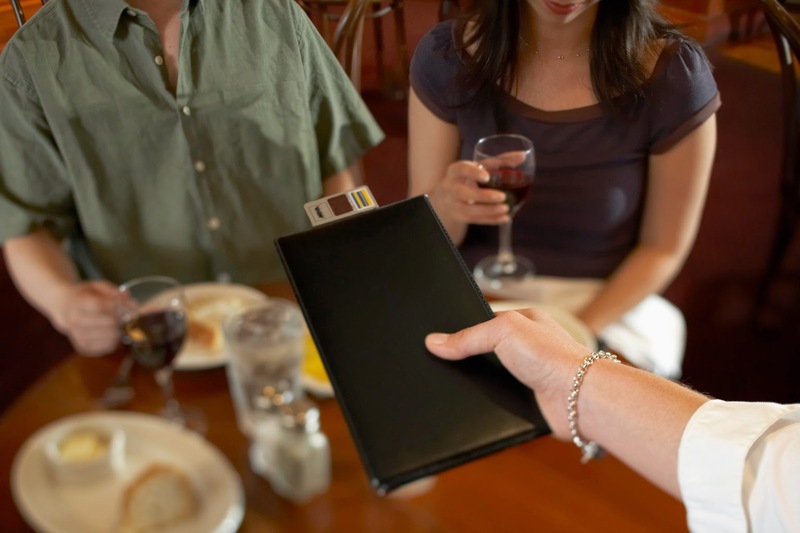 Not only is the check to be presented to diners the moment they put down their cutlery (or even before, as in my case today), entire restaurant visits are judged by how swift the service is: To my continued irritation, in establishments of every quality level, plates are pulled from under diners' noses while they are still chewing their last bites. No matter if everybody else at the table is still eating, the moment the first guest finishes his dish, his plate must disappear at once. Intervals between courses last a few minutes at best, and on more than one occasion have I seen the dessert menu being brought to the table on the occasion of the waiter clearing the last main course plate. If one denies interest in any sweets, then without further ado, the bill appears. It is typically accompanied by the phony sweet "whenever you're ready" line, which feels about as authentic as a Russian mobster telling you that delayed payment would not be a problem. It's a different culture, I often find myself rationalizing, trying not to let an uncalled for check ruin my impression of an establishment. Undoubtedly, many Americans must feel similarly poorly served in Europe, when it takes an eternity for their bill to be delivered - they may even have to ask for it! In America, the term "quick service restaurants" decribes almost every eatery, and not just what Europeans have come to accept as a "fast food" joint. Fortunately, once again Québec revels in cultural exceptionalism. When I showed up at an upscale French bistro in Montréal last weekend with 5, instead of the anticipated 4 American guests in tow, the maitre d' was apologetic. Under the circumstances, he'd have to give us a different table, which would only be available until 21.30h. Would that be acceptable? It was just after 19h when I put the question to my Yankee guests. They rolled their eyes - they had come for a meal, not an eternity. At 20.45h, I had to ask the waiter for the check.